Bear Plaza, the cozy, charming stretch of narrow open space that starts on Middle Street, comes to an abrupt end at Trash Plaza. The area doesn’t have a formal name, and consists of a meandering parking lot punctuated by concrete islands, random shrubbery, garbage cans, and the faint aroma of bat guano — all owned by something like 14 people or entities (see Craven County GIS map, right). While the committee won’t include this recommendation in its report to the Board of Aldermen, for now at least, it is highly likely that work will continue even without the committee’s recommendation. City Manager Mark Stephens said one goal for the project is to extend Bear Plaza so that it connects Middle and Craven streets. Other goals are to reorganize the parking plan and improve landscaping and over-all aesthetics. 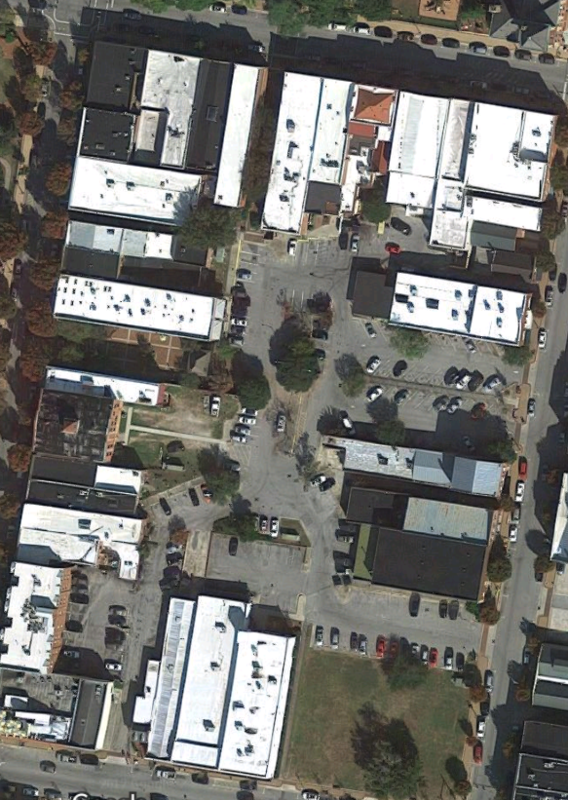 The Trash Plaza area was considered for a parking structure in a 2007 parking study (map, left), but was ditched in favor of a proposed parking structure at the intersection of Craven and Pollock Streets. Glad to see this getting some exposure again. I thought it was a forgotten project because of legal ramifications with property owners.